Wenzhou is a port city about an hour from Hangzhou by high-speed rail, beloved for its sea air and mountain landscape. The foreigner population is minuscule compared to other small cities, but this can be a boon! Plenty of McDonald's and KFCs for when you're craving Western food. Air: Wenzhou Longwan International Airport is located 14 miles outside the city and services about 100 destinations. The airport can be reached by city bus, shuttle bus, taxi and long-distance buses. Train: Trains running along the Jin Wen railways line reach many cities in Zhejiang such as Hangzhou, Yiwu, Jinhua and Lishui as well as other cities throughout China including Beijing, Shanghai, Tianjin, Suzhou, Nanjing and Guangzhou. Bus: City buses play very important roles in the city's transportation system. Tickets for most buses are ¥1.50 (~$0.22). There are no conductors on the vehicles, so it is best to ensure you have enough loose change prior to boarding. There are six long-distance bus stations with more than 130 cross-province and over 1,000 inside-province bus routes operating every day. Taxis: Around 3,800 taxis are serving the locals and visitors in Wenzhou around the clock. The fare differs a little between day and night. Ferries: There are several sight-seeing ferries available to explore the scenic highlights of Wenzhou. There are mainly four shopping malls in the city center of Wenzhou, including Kaitai Department Store, Intime Department Store, Times Square, and the high-end Fortune Shopping Mall, where you can find most well-known Chinese brands and some world-famous luxury brands. In addition, in the newly-developed center of Longwan District, close to Longwan International Airport, a grand urban complex called Wanda Plaza has opened to attract more Wenzhou shoppers. There are also several Wal-Mart stores within Wenzhou. As for supermarkets, we highly recommend taking advantage of the abundance of Chinese cuisines that will be available. However, in Wenzhou, there are several places for imported food, though the price is comparatively high. Among them, HD City Shop, Fortune Mart and PINOU International Supermarket are mostly for imported food, while many supermarkets in Wenzhou have also set up a separate section specifically for Western food. Next to Wenzhou Train Station (温州火车站), there is a big market for cheap clothes and shoes where you generally need to bargain to get a good price. For mobile phones, you can go directly to franchise stores authorized by different mobile phone makers or mobile operators like China Mobile and China Unicom on East Renmin Road (人民东路), where generally you cannot bargain over the prices. Also on the same road is a big mobile phone market called Wenzhou Zhongqiao Communications Market (温州中侨通讯市场). Wenzhou dishes have a long history dating back to the Song Dynasty (960-1279). There are over 250 delicious seafood recipes using fish, shrimp, crabs, and shellfishes as their basic ingredients that are cooked using over 30 different methods. San Si Qiao Yu (Fish Boiled with Three Kinds of Threads) is a traditional Wenzhou dish. The fish is cut into pieces and boiled with bits of chicken, hams and wood mushrooms. This dish is usually used to entertain friends and relatives on festival days by the locals. 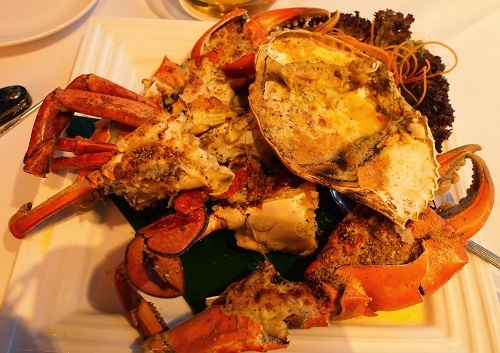 Double Tastes Crabs is a type of savory pancake cooked with crab meat and pork during both steaming and frying, leaving it with two distinct tastes, hence its name. The dish looks like a live crab. Nanji Islands Marine Nature Reserve is the only national marine nature reserve on the East China Sea. Wuyanling National Nature Reserve is located in Taishun County in the southwest part of the city. This mountain forest area is a completely natural environment that has hardly been disturbed by the outside world. Yandang Mountain is a world geo-park located in Leqing County in the southeast of Wenzhou city. Due to frequent volcanic eruptions in ancient times, peculiar cliffs, rocks, caves, and mountain peaks were formed, making the mountain a comprehensive geographic museum. Luqiao, Jiaojiang, and Ninghai are all cities close to Wenzhou. They are certainly worth visiting.